Sadly not shortlisted, so here it is - how to change the party political system and put more women in power - for the world wide web to ponder…..
My vision for Ireland in a hundred years is this: a country where it is normal for fifty percent of the elected politicians to be women; a country where growth and corporate profit are not the main drivers and measures of our success; a country where state education is secular and religious belief, while respected, is an after school activity; a country where the children at primary school level are allocated places in the schools in their locality; a country with a progressive tax system, in particular one where corporate tax is not artificially low and indirect taxes artificially high; a country where afflictions such as gambling, alcoholism, depression and drug addiction become problems of the few as the majority have adopted healthier options such as the dignity of work, exercise, community spirit, life-long learning and philosophical thinking; a country that retains ownership of its water, airports, airlines, gas supplies, coastline, public parks and cultural heritage; a country which is not overly reliant on carbon energy sources; a country that understands the world has finite resources and the need to share them with our fellow human beings; a country where the majority of citizens are actively engaged - a country with a vision for the future. 1. 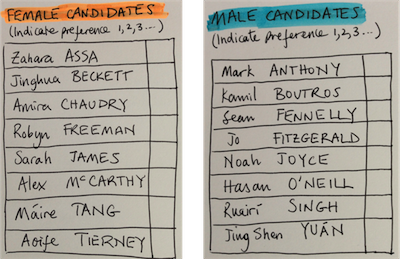 WOMEN-MEN EQUALLY REPRESENTED IN GOVERNANCE – one electoral candidate list for men and one list for women. Any commentator, political party, speech writer, polemicist etc. “borrowing” from this article I would be grateful if you could acknowledge the source.